The Canadian Screen Awards Broadcast Gala is the biggest night to celebrate Canadian cinema, TV, and digital media. This year’s edition of the awards show, which took place on March 31, is unusual because of the confusion over who was going to host it. Initially, I thought that Kim’s Convenience’s star Andrew Phung and comedian Aisha Alfa were going to host. Then the commercial for the awards show this year suggested that Mary Walsh was going to fill the role. Turns out there was no one hosting the Canadian Screen Awards this year, though Phung did appear in the beginning of the awards show. Maria Doyle Kennedy, who you may know from Orphan Black as Siobhan, announced the show. With a two-hour length, it seemed like not a lot of awards were given out because most of the awards were given in the pre-ceremonies. It was much like when CBC aired the Juno Awards this year—the host of that awards show, Sarah McLachlan, was barely seen. The good part about the Candys awards show this year is that the pre-ceremonies were finally broadcast on the internet which means that we got to see more people recognized for their contributions to Canadian content. The ceremonies for the TV categories were aired by CTV through their YouTube channel, although they were removed a few days after taking place, while the ceremony for the film categories was shown on Telefilm Canada’s Facebook page. In film, A Colony (Une colonie)—which involves a rural girl about to experience high school in the urban city—won Best Film as well as two other awards. The film has a lot of firsts with a first-time director, first-time stars, and a first-time producer. The film that won the most awards is The Great Darkened Days (La grande noirceur) with five awards including Best Supporting Actress for Sarah Gadon. Animal Behaviour, the Academy Award-nominated and locally made short film by Bob and Margaret creators Alison Snowden and David Fine, was named Best Animated Short Film. In TV, some of the biggest shows in the country were the big winners this year. In Drama, Anne with an E won Best Drama and is tied with Cardinal for most awards, with seven. Anne with an E also received awards for its main stars including Best Actress in a Drama for Amybeth McNulty. One of my favourite shows Frankie Drake Mysteries received Best Costume Design. In Comedy, Schitt’s Creek got Best Comedy and four total awards, including Best Actress in a Comedy for Catherine O’Hara. The comedy show with the most awards was Letterkenny with five total—including Best Actor in a Comedy for Jared Keeso, who was great in the most recent seasons of the show. 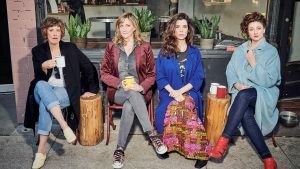 In Variety, The Baroness Von Sketch Show swept the awards again for the third year in a row with four awards including Best Variety Show. In News, the three major newscasts all received awards. The National won the most awards with four, including Best Host of a News Program for Adrienne Arsenault. CTV News National News won for National Newscast and Global National got Best Host of a Newscast for Dawna Friesen. The Canadian Screen Awards this year wasn’t as exciting as in earlier years in my opinion, but more people were recognized and it did convince me to watch The Great Darkened Days.